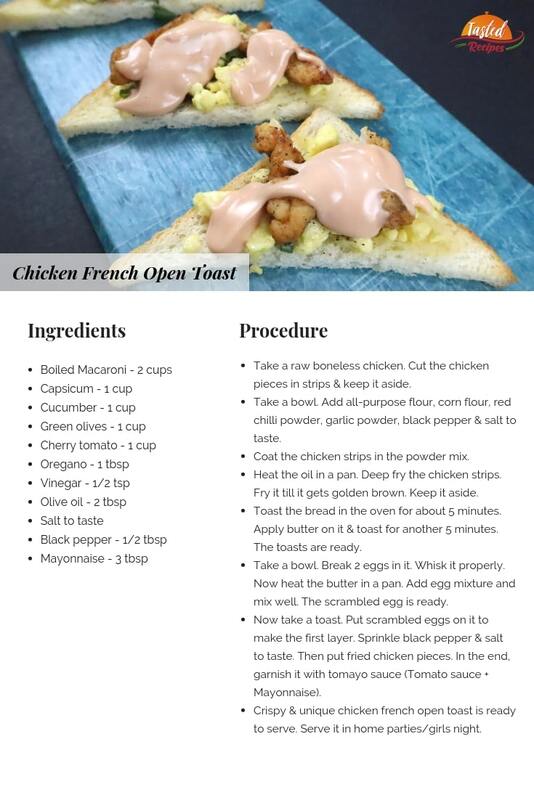 Chicken French open toast is totally a new take. The toast is layered with scrambled eggs, crispy fried chicken pieces & tomayo. The taste is so unique, creamy and loved by kids. The colour of the toast is heart winning. Kids will fall in love with it. The texture and taste are unique & tummy filling. I have made much open toast but this one is really worth a try at your home. Your munching time with your friends at home parties or kitty party, this open toast will create a noise in the house. It’s party pleaser snack item that is unforgettable. Trying something new and tasty in life is necessary. Am I right? Write in comments about this funky french toast. Take a raw boneless chicken. Cut the chicken pieces in strips & keep it aside. Take a bowl. Add all-purpose flour, corn flour, red chilli powder, garlic powder, black pepper & salt to taste. Coat the chicken strips in the powder mix. Heat the oil in a pan. Deep fry the chicken strips. Fry it till it gets golden brown. Keep it aside. Toast the bread in the oven for about 5 minutes. Apply butter on it & toast for another 5 minutes. The toasts are ready. Take a bowl. Break 2 eggs in it. Whisk it properly. Now heat the butter in a pan. Add egg mixture and mix well. The scrambled egg is ready. Now take a toast. Put scrambled eggs on it to make the first layer. Sprinkle black pepper & salt to taste. Then put fried chicken pieces. In the end, garnish it with tomayo sauce (Tomato sauce + Mayonnaise). 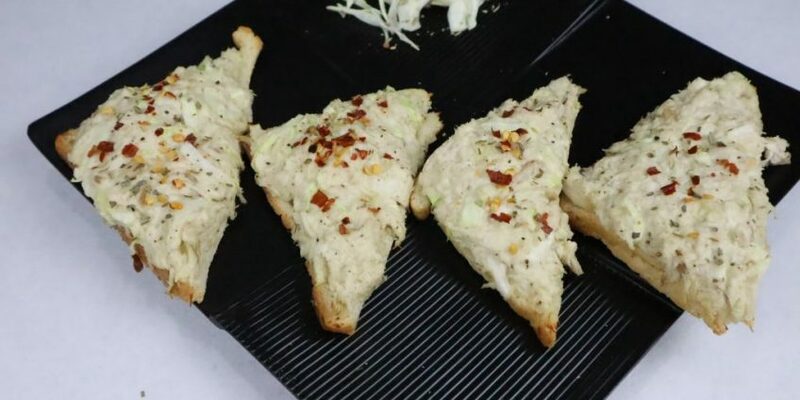 Crispy & unique chicken french open toast is ready to serve. Serve it in home parties/girls night.